Men meet on the 2nd and 4th Tuesday at 7:00 PM. Learn more about your Lodge by attending a meeting. Get a Moose membership application. Chapter #1892 women meet at 6:30 PM on the 2nd & 4th Wednesday. Please attend one of the two meetings. Get your Moose membership application. 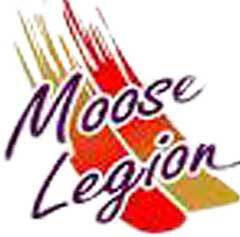 Members of the Moose Legion, the Degree of Service, meet at 5:00 PM on the 4th Tuesday to discuss current activities. Have you joined the Moose Legion? Moose Riders are a valuable asset helping to ensure the future of the Moose fraternity and its endeavors. Women of the Moose Chapter 1892 had three members enter the Academy of Friendship during the FBMA mid-year convention this month. From left: Kristie Frein, Roni Ambrose, Kristin Meissner. The "Academy of Friendship" is the first degree in the Women of the Moose. Co-workers in good standing earn this degree by being installed as a chair of a committee, or an appointed or elected office before January 31st and serve in the same capacity until the end of the Chapter year. She must also have a fundraiser and sponsor 2 new members into her Chapter. Thanks to everyone who donated to pay off the mortgage of our Moose Lodge home! Our calendar highlights recurring as well as special events and activities for Moose members every month. The Guiding Light keeps members informed about activities and people in the Lodge and Chapter. Call or visit the Lodge. We're open 7 days week with food, fraternalism and fun, but you need a Moose card to partake.